No powders, no syrups, just chocolate. Made to pair with The Velvetiser. 10 sachets in 50% milky a best-seller in our cafés from the start. Slightly mellower than our classic 70% dark, has to be tried. No mess and no fuss, the ‘just right’ serving size for the Velvetiser. 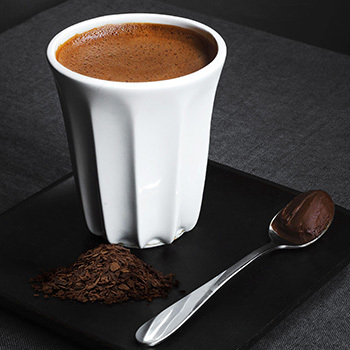 For silken smooth results pair with our in-home hot chocolate system The Velvetiser, designed by Hotel Chocolat, engineered by Dualit. 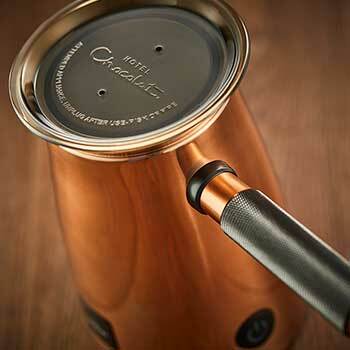 Create your new hot chocolate ritual. No hidden nasties. Just pure chocolate, melted. Enjoy. Ingredients: cocoa solids (cocoa mass, cocoa butter), sugar, full cream MILK powder, emulsifier (SOYA lecithin), flavouring. Milk chocolate contains minimum 50% cocoa solids, minimum 20% milk solids. Dark chocolate contains minimum 70% cocoa solids..
Reference intake of an average adult (8400kJ / 2000kcal). Information shown for the product as made with semi-skimmed milk. Nutritional Information Per 100ml, when made with skimmed milk: Energy 457 kJ (109 kcal) / Fat 5.8 g (of which saturates 3.5 g) / Carbohydrates 10.3 g (of which sugars 8.2 g) / Fibre 1.0 g / Protein 4.4 g / salt 0.10 g.